December 5, 2018 – Is it big news that a bird flew past our Deer Pond Farm preserve in Sherman? In the case of the Rusty Blackbird at 2:15 a.m. on November 8, the answer is yes. That lone fly over – of Euphagus carolinus, to be precise – was the first bird detected by the Connecticut Audubon Society’s new Motus Wildlife Tracking System receiver. The receiver at Deer Pond Farm and another that will be erected at Shepaug Dam in Southbury early next year mean that Connecticut Audubon is now participating in a growing, worldwide network of tracking sites that might well revolutionize bird research. The receivers were funded by a $9,323 grant from FirstLight Power Resources matched with funds from Connecticut Audubon. The Motus system uses lightweight nanotags, tiny transmitters that let researchers track the movements of tagged birds, bats, and even large insects with precision across thousands of miles. Named after the Latin word for movement, the Motus system shares data and maps with researchers throughout the world. This Motus map shows where the Rusty Blackbird that passed Deer Pond Farm (the dot near the bottom) has been detected. Click the map to visit the Motus website. The receivers at Deer Pond Farm look like old-fashioned rooftop television antennas. They point south, west, and east, and are able to detect signals from nanotags up to about six miles away (there’s no north-facing antenna because the sight line is blocked in that direction). More than 350 receivers are active in the Western Hemisphere as part of a growing integrated avian air traffic observation network. The Deer Pond Farm receiver is one of 11 in Connecticut (Shepaug Dam will be the 12th). 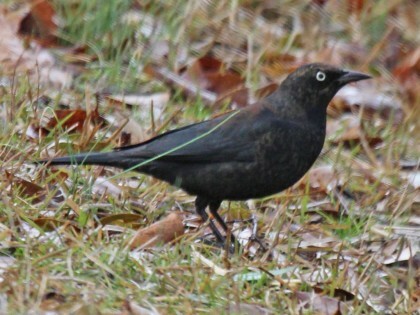 It’s been in operation since late October and the Rusty Blackbird from November 8 is the only bird it has detected so far. But the Motus system is largely a migration-tracking system, and activity at Deer Pond Farm is expected to pick up considerably in spring. The Rusty Blackbird was tagged in Quebec at the Observatoire d’oiseaux de Tadoussac (http://www.explosnature.ca/oot/, OOT) in mid-September as part of a study of that species’ migration patterns by research scientist Junior A. Tremblay of Environment and Climate Change Canada, and Pascal Côté general director of the OOT. The species has been suffering serious population declines, and information about its migratory patterns could potentially help conservation efforts. Click here to learn more about Rusty Blackbirds and their conservation status. A map on the Motus website shows where receivers detected the bird as of early December: along the St. Lawrence River in Quebec on September 29, at the Rachel Carson National Wildlife Refuge in Wells, Maine, on October 23, and then at Deer Pond Farm. Because some Motus researchers check their data more frequently than others, it’s possible that the bird will have been detected elsewhere both before and after November 8. Those detections would show up on the map as data are uploaded to the Motus website. Tremblay and Côté tagged 51 Rusty Blackbirds as part of their project; 33 of those (65 percent), including the one that passed Deer Pond Farm, have been detected by more than one Motus receivers. Click here for details. You can view the Motus map showing where the Deer Pond Farm Rusty Blackbird was detected here. You’ll also find links to the maps showing the routes of all the birds that were detected as part of Tremblay’s study. The Motus system represents a modern approach to an age-old riddle: understanding where birds come from and where they go. Formerly, our insights into bird movements largely depended on bird banding. But the Motus system contrasts with traditional bird banding because the tags actively transmit data rather than having to rely on the infrequent event of a recapture. 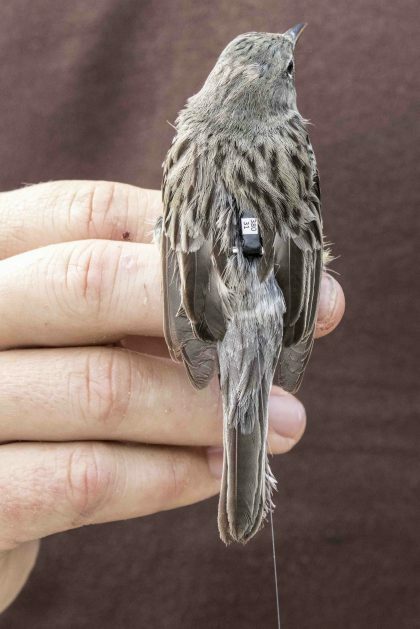 Nanotag on a Kirtland’s Warbler. Photo courtesy of Scott Weidensaul. Both banders and nanotaggers employ mist nets to capture birds. But banders, including those at Connecticut Audubon’s Birdcraft Sanctuary in Fairfield and Bafflin Sanctuary in Pomfret, typically fit lightweight metal or plastic identification bands to the legs of every bird they capture. If a bird is recaptured elsewhere, the information on the band is sent to the U.S. Fish and Wildlife Service. If a banded bird happens to be found, whoever found it might report it, or might not. Ultimately, the percentage of banded birds that are recaptured is tiny, and even then, there is zero information about where else the bird traveled between the first and second capture, or when exactly it did the traveling. The detection rate for nanotagged birds is far higher, as Tremblay’s 73 percent illustrates. When detections occur among multiple receivers, more detailed migration pathways and precise timing are evident. But nanotags cost about $100 each while leg bands are a small fraction of that. So Motus research tends to be more targeted, like the Rusty Blackbird migration study. Connecticut Audubon pledged in its Connecticut State of the Birds 2018 report to investigate sources of funding to expand its involvement in Motus tracking. The Shepaug Hydroelectric dam is owned and operated by First Light Power and is the site of the premier winter Bald Eagle viewing station in the state. More information about the eagle viewing station can be found here. In the shorter term the receivers at Deer Pond Farm and the Shepaug Dam are expected to be an important source of data for others’ research, and are also likely to show how important both locations are during migration. Len Greene, FirstLight’s director of government and regulatory affairs, said the projects are an important part of the company’s outreach and community involvement. “FirstLight Power Resources is excited to be able to support this important scientific project in continued support of the Connecticut Audubon Society’s commitment to conserving the environment,” he said. FirstLight Power Resources seeks to improve the quality of life within the 23-town Housatonic River region by supporting community-based organizations that promote environmental protection, energy efficiency and public safety. For more information, visit www.firstlightpower.com.